Cronan Ranch has over 12 miles of combined hiking, biking, and equestrian trails that criss-cross its prairie of scattered oak woodland on rolling hills of open space, former cattle country under repair. Along its south side, the American River flows by with ideal places for picnicking, swimming, (with caution—big current), and a cool respite from the hot summer heat. Restrooms and picnic tables are provided there along the river, where rafters like to stop and enjoy a big lunch before running the class 3-4 gorge downstream. When this 1400 acre regional park was opened in 2005 it was an instant success. The American River Conservancy (ARC) is credited for raising funds and cobbling this public and private land together to create this wonderful park land. 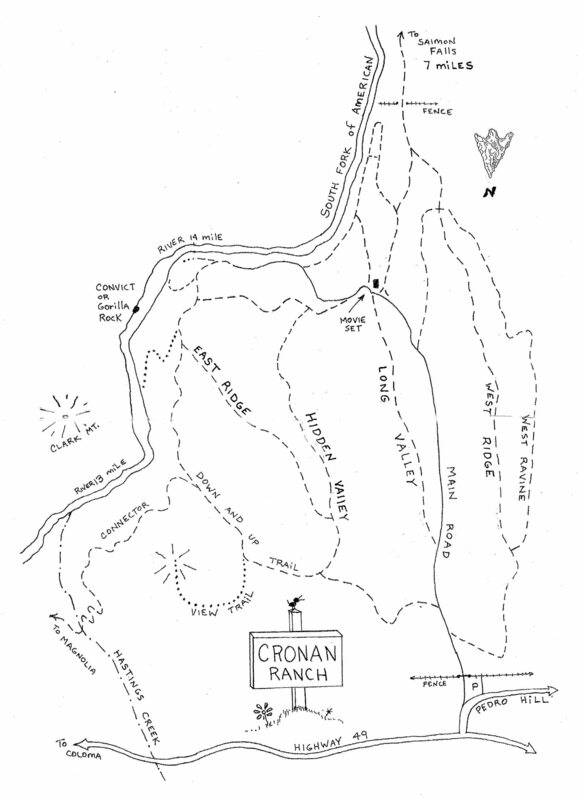 Cronan Ranch is now managed by the Bureau of Land Management (BLM). In 2008 the south gate was removed to allow access into the Norton Ravine lands managed by BLM. This opened up another 3 miles of hiking trails that follow the river downstream to the Satan’s Cesspool area of the South Fork. Then ARC acquired trail easements and built a trail and bridge (see South Fork Trail) that now connects Cronan Ranch to Salmon Falls area of Folsom Lake. The final 2 miles is closed to horses for sensitive plant concerns but ARC is working to acquire a horse trail that will get horses to Salmon Falls on their own path. Please support ARC with their ongoing efforts, without them this area would still be for cows! Directions: From Auburn take Highway 49 to Cool, continue 5 miles to Pilot Hill and just past Pilot Hill turn R on Pedro Hill Road where the parking lot is right off Highway 49. The trails wend around the entire area, mostly following old ranch roads that served the area when it was a working cattle ranch. There is also a trail that goes east and connects this area to the Magnolia Ranch/Greenwood Creek areas.